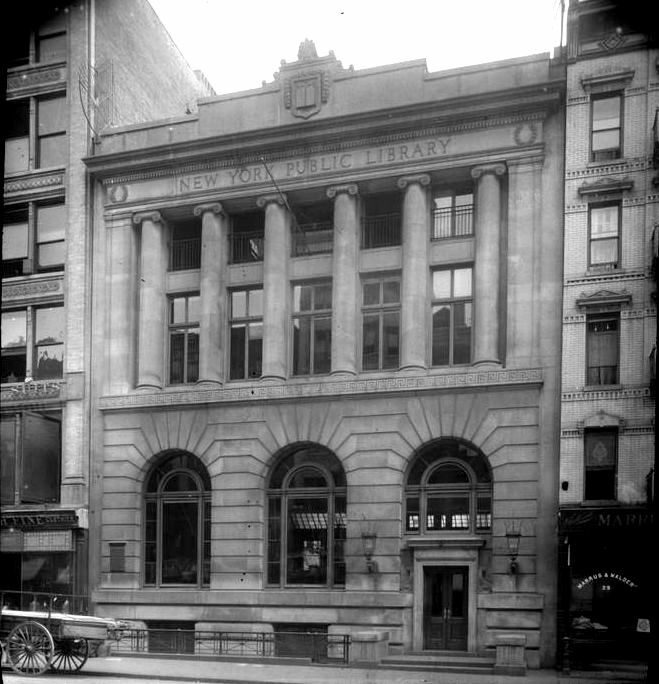 When Andrew Carnegie gave his gift of $5.2 million to the City of New York in 1901 to build public libraries, the Chatham Square library was situated in rented rooms at 22 East Broadway. A year later the city purchased a brick building across the street at 31 East Broadway for $63,000 as the site for the new library. 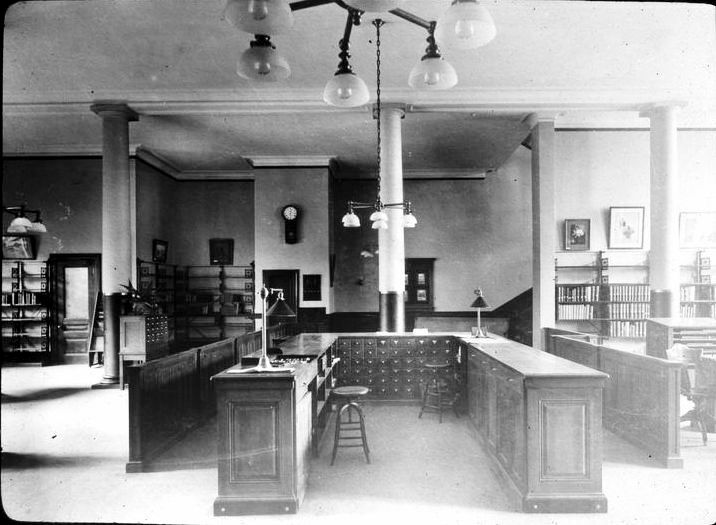 At the opening ceremonies, Arthur E. Bostick, Chairman of the Circulating Department of the New York Public Library made specific mention that there was little fiction to be found in this library and that there were twice as many books on science than in any other library in the city. ﻿ The children’s reading room was on the first floor where children of the nearby tenements could work on lessons and read away from the cramped conditions of home. Plaster casts of classic sculpture decorated the room, donated by Susan Travers. 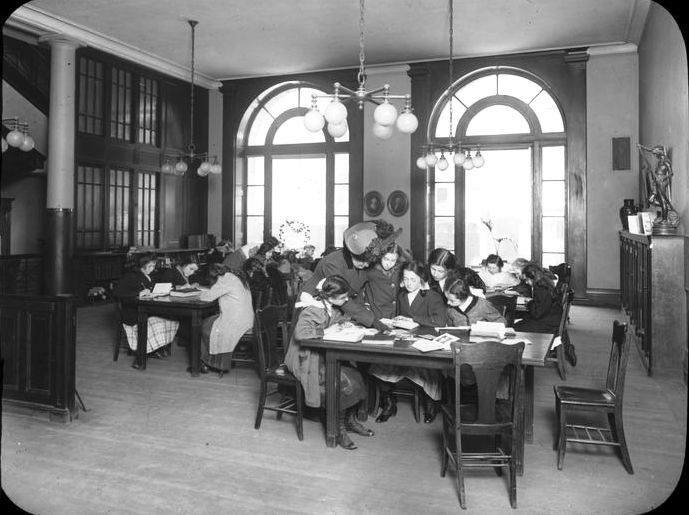 The second floor housed the adult reading room and the newspaper and magazine room was on the third. As more and more Chinese immigrants settled in the Chatham Square neighborhood the need for a Chinese-language library became evident. In March 1908, an new organization calling itself the Chinese Literary Club met in a room in the library to discuss the matter. Three years later the Chatham Square Library put 300 Chinese language books into circulation, creating New York’s first Chinese library. The rich ethnic mix of library users prompted The Times in 1913 to draw a comparison of the Chatham branch to a more sedate branch. “As soon as you enter the room the salient difference between the Chatham Square district and its neighbor, Seward Park, will strike your ear…There is a strong, vital undercurrent to the voices. The place is filled with excited and spasmodic little movements only half subdued by the librarians. A century later when paper books are quickly being replaced by electronic technology, the Chatham Square Library remains an important and well-used facility. According to the New York Public Library, it “acts as a cultural and civic center for a community of avid readers and is one of the busiest libraries in New York City.” The beautiful and refined structure was designated a New York City landmark in 2001. This was my childhood library and I always loved it. Glad to see something of the real NYC remains.